Are electric vehicles really better for the environment? It may seem strange, almost counter-intuitive, to ask whether electric vehicles, particularly two-wheeled vehicles, are better for the environment. Surely, almost everyone knows the benefits of electric vehicles and why they are better than petrol-powered vehicles for the environment? Crucially, electric vehicles are zero-emission vehicles and that means fewer greenhouse gas emissions and cleaner air. Fewer greenhouse gas emissions reduces the impact on the ozone layer from pollution, meanwhile cleaner air means better public health and less pressure on infrastructure and services. Electric motorcycles and scooters use even less energy due to their reduced size, improving efficiency even further. It seems like the proverbial ‘no-brainer’. There has, however, been some disquiet over how balanced the equation is between the reduction of pollution achieved via the use of electric scooters, and other electric vehicles, versus the pollution created by the power stations creating the electricity in the first place. This is an understandable concern on the face of it. However, the statistics available do not support the anxiety around this issue. The key to explaining this is in the comparison between the fuel efficiency of a power stationagainst the fuel efficiency of a petrol-powered car. Research suggests that burning natural gas in a power plant has a 60% efficiency, while burning petrol in a car is only 25% efficient – a 75% energy loss through waste heat against the power plant’s 40% energy loss - the power station is nearly twice as efficient! To further illustrate the comparison, studies suggest that a car running solely on coal-generated electricity emits carbon at the same rate as a car running on 30 miles to the gallon, in other words a vehicle that is much cleaner than the average petrol-powered car. A two wheeled vehicle will emit carbon at an even further reduced rate than this due to their smaller weight and increased efficiency. These figures are based on vehicles in the US, the second largest nation for vehicle production, where the average miles to the gallon figure for 2018 was 25.4 - a record high. There are, of course, variations in energy source between power stations and this impacts upon the extent of the benefits of electric vehicles. 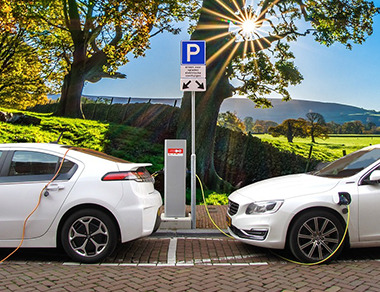 The US Department of Energy’s Alternative Fuels Data Center provides bystate information comparing the emissions of ‘All Electric’ (EV), ‘Plug-In Hybrid’ (PHEV), ‘Hybrid’ (HEV) and ‘Gasoline’ vehicles. Their data cites the national averages for annual emissions per vehicle are, respectively: 4,352 pounds of CO2 equivalent, 6,044 pounds; 6,258 pounds and 11,435 pounds. In areas that are low-coal producing the average for EV emissions is much lower. For example, in New York state the CO2 equivalent is 1,846 pounds. In the high coal-producing state of Minnesota, electric vehicles produce 4303 pounds of CO2 equivalent on average, pretty much in line with the national figure. In much heavier coal-producing states, such as Colorado, the averages level out, however, electric vehicles still produce less CO2 than petrol cars. It’s clear, then, that even with the inevitable regional variations, the use of electric vehicles is a major contributor to reducing carbon emissions, thereby reducing our carbon footprint and our impact on the ozone layer. Furthermore, while electric vehicles will get cleaner over time, thanks to technological advances, petrol-fueled cars are locked in to a less progressive emission reduction range. While the effects of CO2 reduction show results over time when it comes to ozone layer depletion, the benefits of electric vehicles include an almost immediate and very dramatic impact on the air quality in cities and towns. One key indicator of the scale and depth of the problem of air quality is the European Environment Agency's annual air quality report. It shows that most European city dwellers are exposed to a level of air pollution well above what the World Health Organisation says is safe. Improved air quality would reduce the number of fatalities caused by this, estimated at 428,000 across 41 European countries in 2014. Furthermore, it would tackle the rising costs of medical care needed to treat respiratory illnesses like asthma, caused or exacerbated by air pollution, and costs associated with workers’ productivity levels. The benefits of electric vehicles are indeed a no-brainer. Here’s another easy choice. If, like most people, you’re looking for a vehicle that is both clean and powerful then you should check out Zapp’s i300 electric scooter. It is high-performance as well as being fun, sophisticated and sustainable. There’s no compromise here, with an impressive acceleration of 0 to 50 km/h in 2.35 seconds and 0 to 70 km/h in 4.10 seconds. Not only that, the i300 has a torque of 587NM for excellent handling and a peak power of 14 kW. This is all for £5,250 or £19.99 a week. With Zapp you can do your bit for the environment, and do it with style.